1. Due process in the termination of employment requires the employer to give two notices to the employee. 2. First notice: it must provide a detailed narration of the facts and circumstances that will serve as basis for the charge against the employee. It must also give the employee at least five days from receipt to prepare an answer. 3. Hearing or conference: after the employee has submitted an answer, the employer must schedule a hearing. The employee can rebut the evidence presented by the management. The employer and employee can also use this hearing to settle the case amicably. 4. 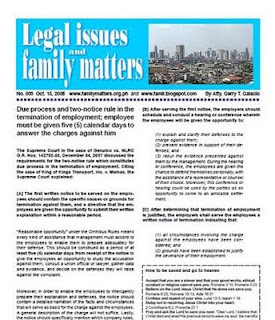 Second notice: if the employer finds that termination is justified, it must give the employee a written notice of termination. 5. The employee can contest the termination by filing a case with the National Labor Relations Commission. 7. Termination for economic reasons but without procedural due process: Termination remains valid but employee is entitled to Php 50,000 nominal damages (Jaka Foods Processing Corporation v Darwin Pacot). [A] The first notice must provide a detailed narration of the facts and circumstances that will serve as basis for the charge against the employee. [B] The first notice must give the employee at least five days from receipt to prepare his answer. [C] After the first notice has been served, the employer must schedule a hearing or conference. The first written notice to be served on the employees should contain the specific causes or grounds for termination against them, and a directive that the employees are given the opportunity to submit their written explanation within a reasonable period. “Reasonable opportunity” under the Omnibus Rules means every kind of assistance that management must accord to the employees to enable them to prepare adequately for their defense. This should be construed as a period of at least five calendar days from receipt of the notice to give the employees an opportunity to study the accusation against them, consult a union official or lawyer, gather data and evidence, and decide on the defenses they will raise against the complaint. Moreover, in order to enable the employees to intelligently prepare their explanation and defenses, the notice should contain a detailed narration of the facts and circumstances that will serve as basis for the charge against the employees. A general description of the charge will not suffice. Lastly, the notice should specifically mention which company rules, if any, are violated or which among the grounds under Art. 282 is being charged against the employees. (3) rebut the evidence presented against them by the management. During the hearing or conference, the employees are given the chance to defend themselves personally, with the assistance of a representative or counsel of their choice. Moreover, this conference or hearing could be used by the parties as an opportunity to come to an amicable settlement. (2) grounds have been established to justify the severance of their employment. Note: The company may schedule the hearing or conference after the employee has submitted his answer. But the better procedure is to place in the first notice the date and time of the hearing or conference (the notice must of course observe the five calendar day requirement).